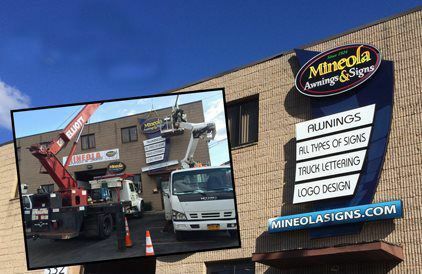 MINEOLA SIGNS & AWNINGS, ESTABLISHED IN 1924 IS LONG ISLAND’S LONGEST RUNNING SIGN SHOP. With broad expertise and years of experience, we conquer the challenges of modern sign technology, while also retaining creativity and craft of yester years disappearing skills. Employee’s currently working for the company have no less than 15 years of experience. Our graphic department is of the finest quality and most experienced personnel in the industry with up to 40 years of experience. Our company currently operated with a full fleet of vehicles. Inclusive of bucket trucks and crane trucks up to 100’. It has been our experience in working with many national accounts and local businesses that their main concern is serving the customer needs in the requested time frame. Our honesty and good service has resulted in tremendous growth to our client base.